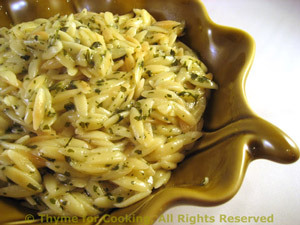 Creamy Orzo, Risotto Style, Thyme for Cookingeasy side dish. The orzo will absorb all of the stock, but should not be stiff. Even after the cheese, it should be loose but creamy. Turn heat to low and simmer until done, stirring occasionally, about 15 minutes.